What Qualifies Me To Help Educate You In This Field? Thank you for your interest in training with us here at the Anglo European College of Therapeutic Hypnosis (AECTH). Therapeutic Hypnosis is often referred to as Hypnotherapy. At the Therapeutic Hypnosis College, we offer a range of courses, seminars, and lectures at various locations around the UK and Europe on hypnosis and related therapies. These include introductory workshops and diploma hypnotherapy training for complete beginners, as well as conversion courses and advanced CPD courses for qualified and experienced hypnotherapists. We are confident you will find something here that will further your education in the field of hypnosis, hypnotherapy and self-hypnosis. 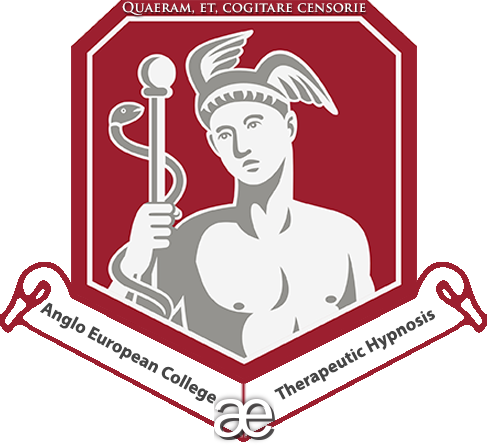 If you look at the logo for the AECTH (Therapeutic Hypnosis College) emblazoned on the pages of this site, you’ll read “Quaeram, et, cogitare censorie“ which is Latin for “Require Evidence and Think Critically” and is a firm ethos of this college. Critical thinking and healthy scepticism are valued here and as well as being useful for any hypnotherapist, helps people to find some clarity in this field which is shrouded in myth, misconception and misinformation. To be innovative and continually research and develop the most effective, evidence-based approaches to clinical hypnotherapy. To provide the highest quality and standard of training along with the most enjoyable learning experience in hypnotherapy available anywhere. To offer our students and graduates a supportive learning environment and ongoing supportive community dedicated to developing their knowledge and nurturing their talent in the fields of hypnosis, hypnotherapy and self-hypnosis. College founder Adam Eason began running self-hypnosis seminars back in 1999 in a variety of locations around the UK, Europe and the US. Such was the popularity of his seminars and related works (books and audio programmes) that he began running a wider range of seminars and a single, annual Hypnotherapy Diploma as of 2003. In 2004, Adam’s training school was approved by the major hypnotherapy associations and went on from there to offer the full HPD qualification offered by the NCH (National Council for Hypnotherapists) and externally assessed by the NCFE. Due to popular demand, more courses were offered, more frequently, and other experienced trainers (all former students of the college who embody the ethos) joined what is now the Anglo European College of Therapeutic Hypnosis. Today, the college offers a suite of courses and seminars in a variety of locations which can be all be read about in detail within the college prospectus’. We offer a depth of education as well as technologically advanced supplementary learning tools, including our online Platinum area which offers all our students additional videos, audios and lectures to enhance their learning experience and develop skills and knowledge; something that to our knowledge, no other hypnotherapy training college offers. I have been in full-time clinical practice as a hypnotherapist since 1996 and have worked with more than 3000 individual clients for a very wide range of issues in that time; a lot of my teaching is based upon that real-life experience. However, this college places a great deal of importance in evidence-based practice and principles and so whilst anecdotal experience is appreciated, it does not rule the day here. Whilst we do adhere to evidence based practice as much as possible, there are many aspects of these fields that do not have direct evidence to support them, therefore we offer evidence-based principles where we can and also highlight the flaws cited by academics and researchers in certain other approaches too. This is a central ethos of this college and has been since it was founded. All of our students are encouraged to understand both sides of any debate, philosophy, approach or theory and then develop their own stance. It has been my experience that professionals who are erudite, informed and have a depth and breadth of knowledge rather than being entrenched in the dogma of the training school they attended, go on to have the most thriving and successful careers in this field. With my PhD research, I authored the first systematic review and meta-analysis of the efficacy of clinical applications of self-hypnosis to feature in a peer-reviewed academic journal (Featured in APA Psychology of Consciousness Journal: Clinical applications of self-hypnosis: A systematic review and meta-analysis of randomized controlled trials). Likewise, I have been among the first to study the application of self-hypnosis to inhibit the Stroop effect, an area of great interest to the field of cognitive neuroscience. Today, my ongoing research continues to examine the efficacy of self-hypnosis to advance strength and cardio-respiratory endurance. I lecture for the University of Bournemouth and the Royal Society of Medicine on their MSc in clinical hypnosis and research programme. I was the first hypnotherapist to be asked to be on the panel of experts for the TalkHealth online clinics in collaboration with NHS Choices here in the UK, alongside conventional doctors and renowned medical experts. I am regularly invited to lecture in a variety of countries each year. I was a founding member and am today Education and research officer for the PHN (professional Hypnotherapy Network) which is a leading organisation based in the UK seeking to further and develop the hypnotherapy field. I am also organiser of the UK Hypnosis Convention, one of the largest events of it’s kind in the UK and Europe. I am the author of several highly regarded books on hypnosis including The Science of Self-Hypnosis: The Evidence-Based Way To Hypnotise Yourself and Hypnosis For Running, my audio programmes sell globally and I have appeared on primetime TV on both BBC1 and ITV in the UK displaying my work. I broadcast one of the most highly respected and popular hypnosis podcasts in the world, interviewing experts, pioneers, academics and respected authors and engaging them in friendly, respectful debate. I love teaching, I love this field, I get very excited in class on many an occasion. Most importantly, I believe therapy should be enjoyed and fun where possible and when appropriate. I believe learning should be fun throughout. I believe life should be fun and enjoyed with as much joy and laughter as is humanly possible. Thus, whilst we ensure a sober approach when necessary, this college aims to ensure that fun, games and laughter are an integral part of our courses. We find this to be an important way of creating valuable stimulus for the brain when learning. There is nothing worse than being sat like a zombie guppy fish, inanimately staring into space, bored throughout a training. I am also a husband, father of two, a multi-marathon runner, a cottage gardener, an avid sci-fi fan and utter hypnosis geek. All of which greatly influence my approach to teaching and the way I illustrate class material. Although I founded this college and much of my own ethos has forged it’s tone and approach, it would be remiss of me to suggest that it is exclusively my influence that has flavoured what we do and how we do things here. We have a thriving community around the college that is based online at our hub, at CPD events, at support groups we run, geek dinners and our social functions such as our annual Summer dinner dance and Christmas party. Those that regularly attend shape the tone of the college too. We have course assistants and numerous other tutors on our courses who all have a depth of professional experience, comprehensive education and input greatly to the way the college is run. Most importantly, we have exceptional graduates and new students each academic year who make their mark, give us feedback that we respond to and help shape what we do. The downloadable prospectus available at this website aims to give you as much detail as you can cope with regarding our main courses and seminars. We do offer other courses, seminars and lecture events which will feature here. If you have any questions or queries regarding any element of our training courses, this college or this field in general, then please do get in touch with us, we’ll always do our best to get back to you within one working day. I truly hope that we get to warmly welcome you to the Anglo-European College of Therapeutic hypnosis at what we believe is an incredibly exciting time for this wonderful field.